Home > Discussion > In 1970, Indianapolis and Marion County Consolidated. Here’s What St. Louis Can Learn. In 1970, Indianapolis and Marion County Consolidated. Here’s What St. Louis Can Learn. From St. Louis Magazine: Things are going to get better,” says John Krauss, an attorney and mediator from Indianapolis, “but they’re not going to get better immediately. Everything’s supposed to be like never-never land? 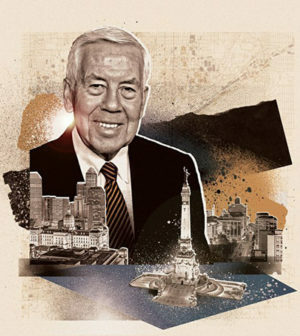 No, it isn’t.” In the late 1960s, Krauss worked with former Indianapolis Mayor Richard Lugar (pictured) to create Unigov, or “unified government,” a consolidation of the city of Indianapolis and neighboring Marion County. It was during a period of history—the 1950s and ’60s—when mergers were taking place everywhere. Jacksonville, Florida; and Nashville were two other major cities to enact city-county mergers at the time. Fifty years later, Better Together is proposing something similar. Better Together’s members use stats from other cities that have consolidated a city and a county government, such as Indianapolis and Louisville, Kentucky, which underwent a merger in 2003, to illustrate why they believe that St. Louis should do the same. Statistics and personal accounts say the Indianapolis merger was a success. According to research by Jeff Wachter, who studied the impact of the city’s consolidation 40 years on, population grew while those of cities of similar size (including St. Louis) declined. Employment rose every year through 2011. The city’s tax base became larger, and Indianapolis completed more than 50 development projects, including work on the zoo, the children’s museum, the city market, and the now-demolished Market Square Arena. It also attracted an NFL team, the Colts.